032c Workshop / Joerg Koch presents Walter Pfeiffer, Scrapbooks 1969-1985: In an ensemble, Walter Pfeiffer’s scrapbooks create a very unique Wunderkammer. Pfeiffer’s Polaroid’s and photographs interchange with miscellaneous objects – newspaper clippings, postcards, packaging, tickets – and brief punning notes. Pfeiffer assembles this archive into a large collage full of surprising references and comparisons that are both a visual diary and the creative foundation for his artistic work. 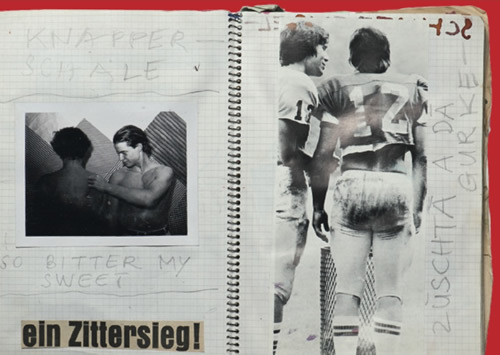 Pfeiffer’s scrapbooks sharply reveal his keen view of Eros, Zeitgeist and popular culture, along with his disrespectful humor as well as his appreciation for the poetry in the mundane and banal. Offering a view into Pfeiffer’s meandering and playful universe, they are a contemporary document that captures the Zeitgeist of the 1970s and 1980s with an ephemeral elegance.